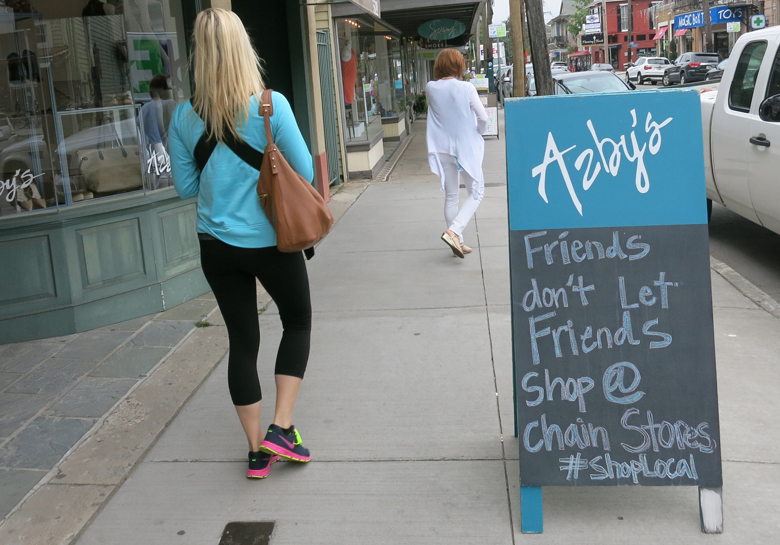 A sign at Azby's, a women's clothing store on Magazine, exhorts people to shop local. On the next block is Chico's, a national women's clothing chain. From an urban design perspective, Magazine Street wins the trifecta. It’s got walkability, diversity, and historical authenticity. Throw in its predominance of independent businesses and you have a one-of-a-kind street. Magazine embodies the essence of what also makes New Orleans special. It showcases the arts, culture, cuisine, history, and entrepreneurial innovation of a city that shuns the mainstream and is internationally beloved for it. But as Magazine’s post-Katrina success catches the eye of national chains, the storyline may be changing. It’s a process that has played out in countless communities across the country. Independent businesses set up shop, often in unproven territory, and create an ambience conducive to shopping and community life. National chains — a breed better at following than leading — then swoop in to capitalize on the vibrancy that they never could have created themselves. As an increasing number of chains express interest in an area, rent prices rise to a level only they can afford. The independents initially responsible for the street’s success are displaced, and a street that once possessed its own distinctive character is transformed into a mall turned inside out. Over the past year, businesses along Magazine Street have been reporting a tide of unaffordable rent increases, and, sure enough, it coincides with increased interest in Magazine Street from national chains. West Elm is soon slated to join a cast of national retailers that already includes Walgreen’s, Jamba Juice, Starbucks, Chico’s, Whole Foods and Radio Shack — to name just a few. Unconfirmed rumors coursing up and down Magazine Street have two prominent national clothing chains fixing to set up shop. In response, Stay Local!, the Greater New Orleans independent business alliance, recently surveyed 23 independent businesses from the 1900 to the 5800 block of Magazine, among them a wide variety of retail and service providers. The final report was just released, and the results are compelling. Sixty-five percent of businesses surveyed had “noticed a higher than normal rate of rent increases along Magazine Street.” Seventy-eight percent were worried about the impact on their businesses, with 76 percent fearing the soaring rents would force them off Magazine altogether. Consider the case of Heidi Hammond, owner of Parcel & Post, an independent shipping store where you can ship a package and, while you’re at it, pick up a local CD or piece of art. In May of last year, Hammond’s building was sold. The buyers planned a renovation and offered Hammond a new lease following the build-out that would have had her paying over eight times as much as before. Churn like that is costly for independents. “This experience has set my business’s financial plan back by two years,” Hammond said. We have a chance to take proactive, common-sense steps to maintain a uniquely New Orleans experience on Magazine Street, or we can let it go the way it’s heading. Not only are rents rising, landlords are increasingly insisting on leases that impose additional costs on tenants. As one Magazine Street service provider put it, “my landlord has made it clear that the terms are going to be very different when my lease comes up for renewal next year. She won’t sign a long-term lease like the one I am currently in, and she wants to raise my rent while also moving me to a triple-net lease.” A triple-net lease requires that in addition to paying rent, the lessee is also responsible for paying the property taxes, insurance, and maintenance costs for the space. Independent businesses aren’t fighting just against changing conditions on their blocks. City economic developers are aggressively courting national retailers to open in New Orleans. If these companies set their sights on Magazine Street, they’re likely to offer the developer a juicy lease arrangement that few landlords could refuse. Word spreads, and soon other owners start demanding the high-dollar, triple-net deals that only a national chain can afford. Why is chain encroachment an issue? Study after study has shown that local independent businesses recirculate more of their revenues locally. The upshot? More jobs, income and wealth for New Orleanians. That’s because independents typically source business services and goods from other New Orleans businesses. Moreover, they spend their profits and make charitable donations within the local economy. Chains, on the other hand, tend to perform these activities out of state. In fact, a 2009 study commissioned by the Urban Conservancy found that, compared to chains headquartered out of town, independent businesses on Magazine Street recirculate exactly twice as much of their revenues locally. Magazine Street does possess a couple of potentially mitigating factors. Parking is a pain, and the parcel sizes tend to be on the small size. The independent businesses that aren’t afraid of being forced off the street tend to report a strong relationship with the owners of their buildings: “My landlord wouldn’t raise the rent on me like that,” one tenant said. But on the whole, these built-in factors may not be enough to ward off widespread chain encroachment and the rent hikes and business disruptions that follow. As such, New Orleans should take a look at one policy tool for Magazine Street that communities across the country have employed to curb chain encroachment: developing a “formula retail” policy. San Francisco has been doing this for the past decade. Importantly, the process allows ample opportunity for public input, pro or con. New Orleans does not want to be looking back 10 years from now and kicking itself for letting one of the most eclectic and unique shopping streets in the world go the way of mainstream America. That’s what the rest of the country is for. We have a chance to take proactive, common-sense steps to maintain a uniquely New Orleans experience on Magazine Street, or we can let it go the way it’s heading. Which will it be, New Orleans? Mark Strella is project coordinator for Stay Local! Travis Martin is a Stay Local! intern and a candidate for a master’s degree in urban and regional planning from the University of New Orleans. They can be reached at info@staylocal.org.